500 1 lb Paw Print Coffee Bags 4-3/4"x2-1/2"x9-1/2"
1 lb. 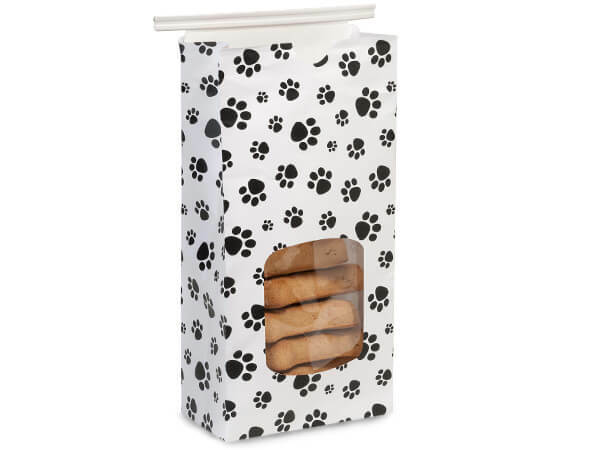 White with Paw Print Tin Tie Window Coffee Bags by the carton. Made from stain resistant 50# basis bleached kraft paper with laminated clear poly liner and tin-tie closure. Complies with FDA regulations for food packaging. Made in the USA. Paper Tin Tie Coffee Bags are available in White Gloss Clay Coat or Natural Kraft with a laminated liner. Window bags are also available. These bags have a flat bottom and an easy to use tin tie closure attached. Just fill them, fold the ties in and they are ready to go! Complies with FDA regulations for food packaging. Available in cartons or mini-packs. Made in the USA.